Having trouble lighting your fire? With the Phoenix Firelighter you do not need to use firelighters, newspaper or kindling to light your stove,this little gadget does it all for you at the minimal cost of 1p per fire. The Phoenix firelighter is suitable for open fires, log burners, multifuel stoves, woodburning stoves, fire pits, pizza ovens and barbeques. 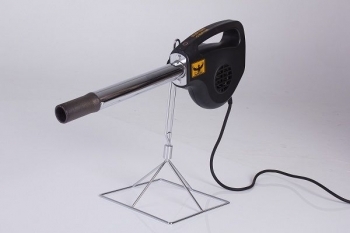 The fully adjustable stand allows the firelighter to be adjusted up or down and tilted backwards and forwards to suit your situation, giving you a maximum reach and height(including the nozzle) of 500mm. The stand is 358mm heigh and the base measures 220mm x 220mm. The Phoenix firelighter is very simple to use. First place the nozzle 2cm away from the fuel source and then plug into the mains power. Press the on/off button to begin lighting your fire - it should take about 2 minutes. When you are happy that the fire is going, press the on/off button to set the fan off to cool down the appliance. At the same time, it is providing your fire with oxygen to get the fire off to a good start. Once it has cooled down you can safely store it away. We offer FREE DELIVERY on this item.